Below some views of our house, pool and the surrounding countryside. 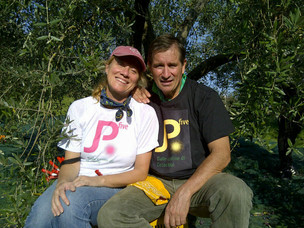 Paola and Jeff live in Rome, Italy. Paola is working for an international organization and Jeff is now retired. During the past nine years they dedicated a large part of their time to completing their country house and transforming their five hectares into the landscape that it is today. Our country home is set within 5 hectares of olive trees, walnuts, truffles and natural forest. A small stream forms the boundary at the bottom of our property and a great view is at the top. Our house is surrounded by a garden area directly overlooking Todi and the surrounding countryside. Mature forest is behind the property, in front are vineyards and farm fields; olive groves are above and below. Our home is new but made with characteristic stone construction, wooden beams and cotto floors. The local village of Cecanibbi is a 20 minute walk away. It consists of about twenty-five persons and can be reached directly from the property on pathways passing through vineyards, olive groves and forest. On Friday and Saturday, you can enjoy a traditional Umbrian meal at the social centre. The medieval walled town of Todi is approximately fifteen minutes drive from our house. Todi and the area around it has been mentioned as a great place to live on the basis of its environment, housing and lifestyle. We confirm that.